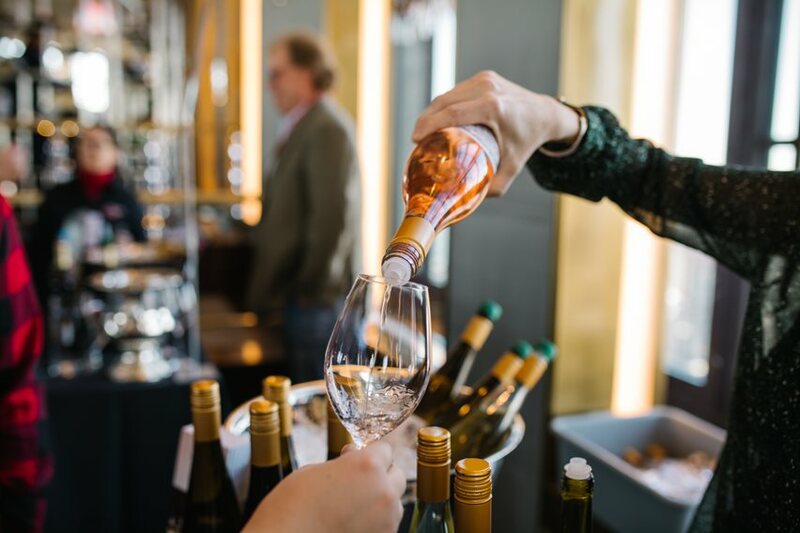 On a recent spring morning, in New York City’s iconic Rainbow Room, sixty-five floors above Midtown, The New York Wine & Grape Foundation held its Eighth Annual NY Drinks NY Grand Tasting. The day was clear, with One World Trade and The Empire State Building in perfect sight. The sunlight danced into the room with an extra spring in its step, reflecting the confidence and curiosity of the state’s finest winemakers and tasters. The New York Wine & Grape Foundation is a not-for-profit corporation established in 1985 that aims to elevate awareness of all wineries and grape-growers of New York State. Furthermore, The Foundation’s objective is to lay the groundwork for promoting a top-notch image of the state’s wines from its various terroirs through innovative studies and advocacy. The Foundation responsibly gives a voice to the farmers, producers, and consumers of the nation’s third highest wine production state. Almost every style of wine is created here, from classic traditional method sparkling to bottlings of the American vitis labrusca grapes seyval blanc and baco noir. These hybrid grapes were discussed in a separate in-depth seminar (that everyone wanted a seat to) moderated by Master Sommelier Pascaline Lepeltier. The tasting presented the best-of-the-best of the state’s viticultural areas. Even the locally sourced bottled water Saratoga Springs was available to quench parched palates. The well-known Finger Lakes AVA was in attendance with producers bringing to the table their best bottlings of riesling and pinot noir. Some homegrown hybrids like vignoles and fun international varieties like the Georgian grape rkatsiteli or the Austrian blaufränkisch also had representation. For those with a sweet tooth, ice wine from the Finger Lakes is not to be missed. Hudson River Region, Long Island, Niagara Escarpment, and Brooklyn filled the rest of the room with a modest, but passionate turn out. The dedication to viticulture these families possess give a story and a face to the wine. Bottlings of baco noir rosé, seyval blanc bursting with a summer freshness, cabernet francs that could rival Loire Valley all pulled in tasters with a curious temptation. Collectively, four-and-half million visitors each year flock to the state’s 11 American Viticultural Areas to learn more about the each region, unique grapes, and styles. Thirty-five thousand acres are wrapped up in vine and nearly 450 wineries contribute to the annual production of 200-plus million bottles. In addition, 288 wineries have been created in the last 10 years and viticulture efforts pump over five billion dollars into the state’s economy. Thirsty consumers will have to wait until the Ninth Annual NY Drinks NY to see what’s next for New York wine, but, until then, below are some standouts from this year that are available now. Husband and wife Matthew Spaccarelli and Casey Erdmann founded Fjord Vineyards in 2013 with a commitment to producing stellar wines from vitis vinifera grapes while enlisting sustainable viticulture and low intervention winemaking techniques. Fjord’s 2017 (a phenomenal year for them) Albariño is bursting with a lip-smacking freshness, a pleasant salinity alongside notes of white flowers and gooseberry. Cameron and Maren Hosmer established their estate vineyard in 1985 on Cayuga Lake. Hosmer Winery farms 70 acres with the belief that great wine begins in the vineyard. Pretty floral aromas of lavender and violets sit on top of brambly purple fruit notes evolving with each swirl. Their Cabernet Franc is their flagship red and the 2016 vintage awarded them New York Cabernet Franc Winery of the Year at the 2018 New York International Wine Competition. The Macari Family owns and operates this 500-acre waterfront estate. Joseph Macari, Jr., is a leader in the region of biodynamic principles and sustainable farming. The estate is also a working farm. All bottlings are 100% estate fruit. Their 2015 Pinot Meunier may be bottled in only 375ml bottles but this wine erupts with intense flavor of dried currant and rose petals. Five generations of the Wagner Family have been growing grapes in Seneca Lake, making it one of the oldest wineries in the region. All fruit is estate grown and cultivates 215 acres of land. Sensual notes of apricots and white peaches pave the way on the palate for a lingering, crisp, sweet finish. Their Riesling Ice Wine is a crowd pleaser and won the title of New York Ice Wine Winery of the Year at the 2018 New York International Wine Competition. Ravines Dry Riesling was another Finger Lakes favorite! Red Newt Cellars has been producing a wide range of wine from dry reds to dessert from Seneca Lake since 1998. With innovate techniques, winemaker Kelby Russell makes wine designed to enjoy for years to come. This unctuous dessert wine is 100% Niagara—a crossing between the vitis labrusca grapes concord and cassady. Only 300 bottles are released at a time.